Situated in an enviable position at the edge of California's beautiful Monterey Bay area, one of the largest marine sanctuaries in America, Monterey was settled in the 1770s. Monterey features many stylish and historic buildings and renovated adobe structures, often epitomizing the area's Mexican and Spanish heritage. The town center is fairly compact and Monterey's scenic waterfront area is just a few blocks away. Monterey's 'Path of History' walk is popular with tourists and connects 37 of Monterey's most important sights. Famous tourist attractions include the exceptional Monterey Bay Aquarium and Cannery Row shopping district, both of which can be found on the northwestern side, in 'New Monterey'. With jazz festivals, golfing tournaments, countless marinas, water sports and typical Californian sunshine, it is easy to see why Monterey has become such a popular tourist destination. 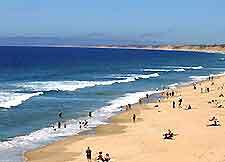 Tourism has long been embraced in the Monterey area and due to its stunning scenery and numerous coastal resorts, Monterey has become a major tourist destination in California. The main tourist information outlet in Monterey is the helpful Visitors Center at Camino El Estero and Franklin Street, which is open throughout the week. Offering a range of tourism advice, travel guides, information about local accommodation availability and leaflets describing Monterey's main tourist attractions and activities, this center is a good place to visit when you first arrive in this area. With a host of waterfront hotels offering impressive views, Monterey has a range of accommodation to suit all requirements. Many hotels in Monterey are located around the bay, peninsula and Fisherman's Wharf areas, close to the city's vibrant Cannery Row, and nearby Monterey Regional Airport (MRY). 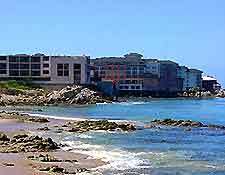 Many further hotels can be found in numerous neighboring coastal resorts, such as Pacific Grove and Pebble Beach. 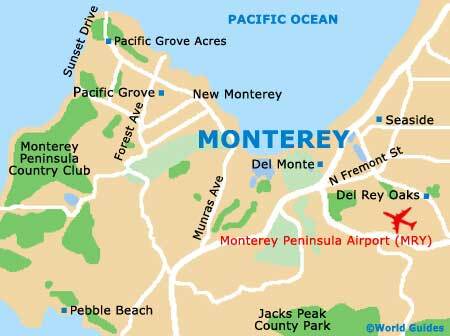 More information about Monterey Hotels. Monterey's popular tourist attractions include Monterey Bay Aquarium - home to a wealth of spectacular sea life in one of the world's largest aquariums; Baywood Cellars Tasting Room - offering wine tasting of some of California's finest wines; and Rent-a-Roadster - an unusual opportunity to experience driving a Model-A Roadster around the Monterey area. More information about Monterey Tourist Attractions. Some of Monterey's main museums and art galleries include Monterey County Youth Museum - ideal for families and featuring numerous hands-on exhibits and fun information; Steinbeck Wax Museum - with numerous imported life-size wax figures; and Monterey's Ansel Adams Gallery - featuring a variety of impressive photographs, together with many books, handicrafts and fine arts. More information about Monterey Museums and Art Galleries.